This graph appeared in a practice test for the MCAT. I am trying to interpret it, but it confuses me a bit. On the x-axis we have some introduced genes, and on the y-axis we have % of cells infected. What I don't get is what the top part represents. How do the "Culture cell genotypes" relate to the rest of the graph. I would also like to know what -/- and +/+ mean. By the way, information in the passage lists CatB and CatL as mammalian proteases, and their inhibitors reduce the infectivity of viruses with the EGP glycoprotein (found in Ebola virus). 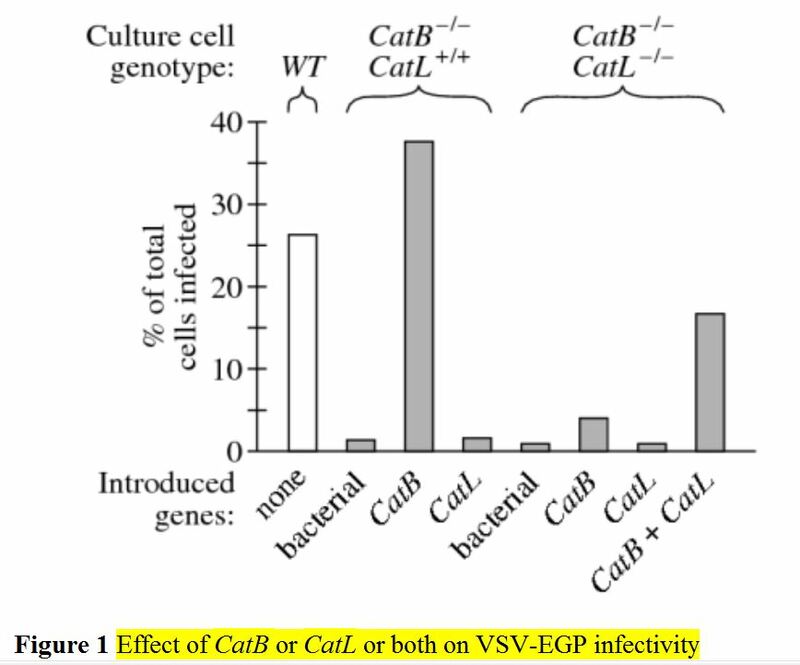 Based on the passage, does optimal VSV-EGP infection in vitro require CatB, CatL, or both? Based on the passage, is CatL expression sufficient for VSV-EGP infection of the mouse cell lines presented in Figure 1? Plus and minus describe what is happening in a specific locus in the genome. When a + sign is shown, the locus contains the natural, fully working gene (wild type). When a - is shown, it means that by natural mutation or lab manipulation, cells lack that natural gene, or make a negligible amount of it, or make a broken variant etc. These cells are diplod, meaning they have two homologous chromosomes. If +/+ is shown, both chromosomes carry, in that locus, a working gene. If -/- is shown, both copies are not working. If a cell is CatL -/-, both its natural copies of CatL are missing or defective, and the cell is unable to make the corresponding protein. The manipulation through which a naturally occurring +/+ is turned into a defective -/- is called a knock out. The top part of your chart shows what is happening in the nucleus, on the chromosomes, at the actual places where normal cells store their CatL genes. You don't give much detail, but the bottom of the chart appears to show some manipulation away from the normal locus. There are ways to introduce more copies, to stick them into the nucleus, or even in chromosomes etc, but the main point about introducing DNA is that often it will not work as well as the natural thing. Optimal infection means something close to the first column, about 25%. By skimming through the chart we are definitely seeing good infection in column 3. Also by comparison with the low levels, we could call acceptable the infection in column 8. The other columns are all clear failures to infect. The second column is the simplest to interpret: knock out CatB alone, and the infection is gone. Thus, CatB is required for infection. The third column reinforces the same point: restore CatB and infection is back to normal. The sixth column shows cells where CatL and CatB were knocked out, but then CatB was reintroduced. We know from column 3 that knocking out and restoring CatB should keep infectivity, but in column 6 infection is gone. The only difference between columns 3 and 6 is the knockout of CatL, and its consequence is lack of infection. Thus, CatL is also required for infection. You may say both CatL and CatB are required. The other columns are control conditions which show that the experiment was well designed and yielded expected results, rather than gibberish. For example, column 5 show that if you knock out both, infection is gone. It would have been very concerning if it weren't gone. Etc. Your second question is really one of logic: is CatL sufficient? We established that CatB is required, and so there is little CatL could do to supplant its absence. Therefore, logically, CatL should not be sufficient. But we have a better proof, from the experiments. In column 4, those cells have their natural (endogenous) CatL, topped by some more CatL. But they are still not infected, beause they lack CatB. So CatL, even in larger-than-life amounts, cannot compensate the absence of CatB. CatL is not sufficient. Not the answer you're looking for? Browse other questions tagged genetics virus cell-culture or ask your own question. What is an Ihh-/- mouse? How much time do INS1-E and MIN6 cells need after splitting? How do the variable portions of antibody genes look in cells which don't produce antibodies? How to identify genes in Ralstonia that synthesize PHB and promote granule formation?